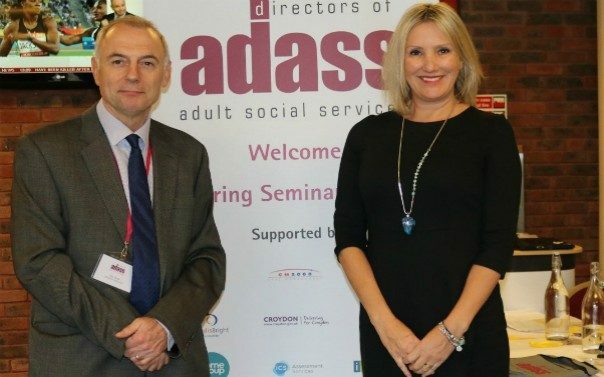 Educating the public about the value of social care will be the “single most important task” for incoming Association of Directors of Adult Social Services (ADASS) president Glen Garrod. Speaking at this year’s spring seminar, Garrod, executive director of adult care and community wellbeing for Lincolnshire council, argued that service users and their families could be “the force for change” in helping council bosses “get what they want” from “sector defining agendas”. The need to share the “heroic” stories of care workers practising on the front line was emphasised by the president as he echoed the view of outgoing Care Quality Commission chief David Behan, who said last year that the sector could “not afford to be seen through the prism of the NHS”. In addition to raising awareness of the importance of social care among the public, Garrod used his inaugural speech to discuss integration with the NHS and explained that ADASS would look to form a “critical friend relationship” with the healthcare system during his presidency. Learning to respect differences and recognising that “disagreement is sometimes helpful” would be key to how the two sectors would work together, according to Garrod. Following his address, Community Care quizzed the president about what he meant by the phrase. Although the president acknowledged the health and social care sectors would need to share a closer relationship in the future, he insisted the alliance should not inhibit goals to offer patients individualised care. “Personalisation is our space, we cannot stagnate and watch other areas pass us by. There can be no excuses. This explosion of opportunities to expand personalisation is within our gift to reinforce and rejuvenate and it is essential that we deliver,” he warned delegates. In a break from previous heads of ADASS, Garrod refused to set out specific priorities for the coming year. Instead, the president said he would focus on the “series of opportunities” that lay ahead for the sector, such as the green paper and fair funding review. The previous day, health and social care minister Caroline Dinenage told delegates the government wanted “to do more to promote social work as a positive career choice” as part of its green paper on adult social care. Garrod, speaking to Community Care, insisted the government needed to “get [it] right” in relation to the wages of those working in social care. “If you have an opportunity to work in a shop or a hotel, you get paid the same [as a care worker], but you are not doing toileting tasks, or bathing tasks or personal care of other natures. Getting the most out of technology was a similarly clear theme in Garrod’s first address as ADASS president. He highlighted the opportunities of utilising assistive technology and its potential to provide “person-centred” care. In addition, he gave assurances that ADASS would encourage local councils to harness digital technologies to allow patients to live more “independent” lives. “We desperately need to see ‘creative disruption’ in social care, and we must encourage many more people to manage their care according to their own needs and desires,” Garrod said. He also stated that digital platforms would be essential in helping people to pre-empt their care needs ahead of time and plan for the future. When asked by Community Care how he would convince sceptics to embrace technology and its potential role in “person-centred” care, the president spoke about the importance of demonstrating results. “Like any professional group, you have to give evidence of why this is a good thing to do, why is it more effective. I think most social workers, now, are increasingly experiencing mobile working and using tablet technology and, it strikes me that familiarity with the subject matter helps sell the product. “If we open our own minds, we’re more likely to open other people’s minds to the opportunities. That’s not to say robots will end up caring for people,” he insisted. I would have thought that protecting children and young people and vulnerable adults and promoting their welfares would have been the singular most important task – with educating the public about the importance of social care being a part of that?! – along with ensuring a well trained and supported workforce and good multi-agency working to name two other key priorities. Social care seems to have replaced social work in the minds of directors. Whilst it is true that “ social care” as a term covers social work as well as those who provide care the lack of specific references to social workers is a worrying indication of how those in the know see the future of the profession.